"Das ist der sele trost genannt". Second illustrated edition (repeating the woodcuts of the first). The text is a collection of exempla on the Ten Commandments, composed as dialogues between a confessor and his confessant. The (large) Seelentrost (‘Consolation of the Soul’) is a collection of more than 200 exempla on the Ten Commandments, written in the form of concise dialogues between a confessor and his confessant. The unknown 14th-century author, presumably a Black Friar, used the Legenda aurea of Jacobus de Voragine and the Speculum historiale by Vincent of Beauvais as his primary sources. The exempla include stories from scripture, legends, anecdotes from history (including a complete story of Alexander the Great), visions, miracles, novella-like matter, and narratives of all kinds. The author’s wish, that reading the Seelentrost may distract from books like Parzival, Tristan, and Dietrich von Bern, appears to have been fulfilled, as the Seelentrost became very popular: as many as 45 (34 complete) manuscripts of the large Seelentrost alone survive, and 43 printed editions from 1474 to 1800. 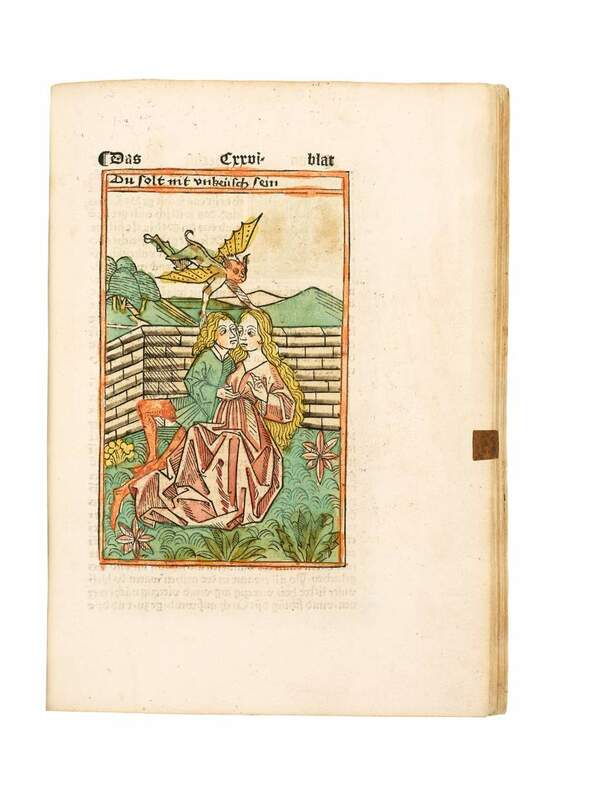 Anton Sorg finished the earliest illustrated edition on 20 November 1478. Its ten magnificent, full-page woodcuts all reappear in his present 1483 edition. The cuts, forming one of the finest woodcut series of the incunable period, show Sorg’s master at his best. They are closely related to the illustrations in Georg Mühlich’s manuscript (Gießen/UB, Ms 813). Extremely rare.